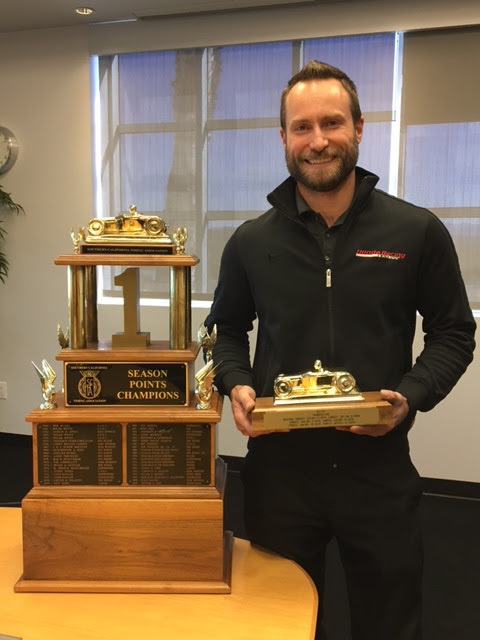 Aaron Hale is a Senior Engineer in Commercial Motorsports at Honda Performance Development, and along with his duties here he is also an accomplished racecar driver. In just his second season racing a 1991 Honda CRX in land speed racing at Bonneville and El Mirage, Aaron and the Hondata Team set several records and finished their season with the 2016 Southern California Timing Association Points Championship. Below is the story of their impressive season. 2016 was a fast year.... Really fast. Coming off my rookie season in land speed racing in 2015, I was set to continue learning as much as I could about the car and the sport. The first meet was in May, and our Hondata Team shook out the cobwebs for a record-setting 215.041 mph run down the 1.3-mile El Mirage dry lake bed course. Unfortunately, as soon as I crossed the finish line, the small 1.5L engine came apart, ejecting a piston and rod through the side of the block. I did not know it at the time, but this set us up for a championship run. We stuck in the only other engine we had at the time, which was a 2.0L engine that was not built for the power we were putting down. We managed the engine through the June and July El Mirage meets, setting records of 201.128 mph in June and 204.180 mph in July, gaining points for each record we set. In August was the Bonneville Speed Week. 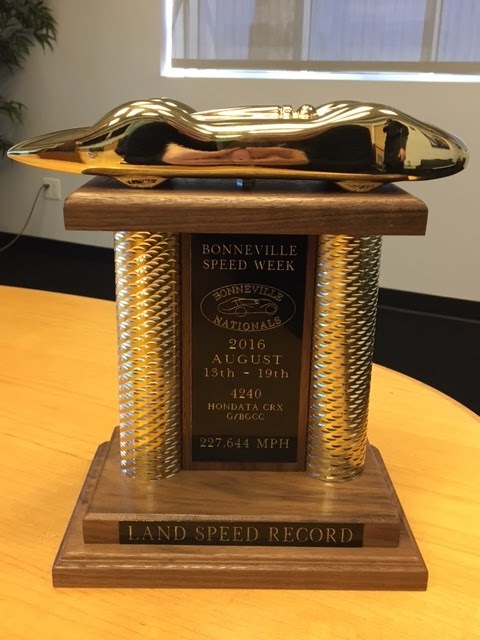 Our goal was to set a record and join the Bonneville 200 MPH Club. We had to turn down the power due to lack of traction on the loose salt surface, but were still able to put down 2 runs, averaging 227.644 mph on the 5-mile-long course, setting a record and securing my place in the 200 club. In September we were back at El Mirage with the same engine. We decided to turn the power back up, subsequently setting a new record of 219.687 mph, and melted a hole through the cylinder head. At this point, we realized that we were in the top 10 in points with 2 meets left. We also had a new 2.1L engine, built for big power, and putting us in a different class again. After some dyno tuning, we were back at El Mirage in October ready to rock. We had over 1000 hp at my foot, and we were ready to use it all. The run went nearly perfect, and we set a new class record of 224.525 mph, smashing the old record by over 20 mph, and putting us in a tie with the 1st place championship car going into the final meet of the year. One month later I was lined up right beside the other 1st place car on the starting line. We wished each other the best luck and got in our cars. The run went perfect, and we set a new record of 227.813 mph down the 1.3-mile course, beating out the other car, and securing the 2016 SCTA Points Championship.